Cling Stamp from Impression Obsession featuring the sentiments "Happy Happy Happy"
Cling stamps from Tim Holtz featuring a collection of leaves and the sentiments "There is beauty in simplicity", "Go where you feel most alive", "A different path doesn't make you lost", "Every adventure is worthwhile", and "Never lose your sense of wonder". Clear stamps from Picket Fence Studios featuring the sentiments "You are part of my tribe", "Kindness matters", and "Nothing soothes the soul better than a 30 second hug". Unique, beautiful and creative stamps designed by Nicole Petersen. Use with paints and inks. Perfect for card making, journaling, scrapbooking, and mixed media. Whether used to complement and expand upon your collection of Birdie Brown imagery, or simply to round out your sentiment options, you must add Birdie Brown Greetings Galore to your stash. 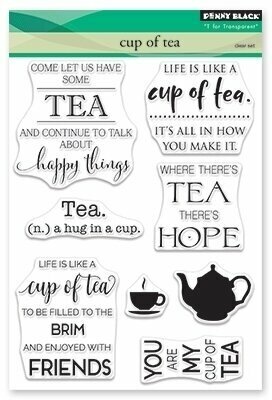 This assortment of eighteen sentiments covers a wide range of occasions and topics. The quintessential Birdie Brown font ensures they will blend seamlessly with other sets in your collection but will work just as well with almost any images you'd like to pair them with. This 18 piece set includes: With Sympathy 1 7/8" x 5/16", Just a Note 1 9/16" x 5/16", Get Well Soon 1 7/8" x 5/16", Thank You 1 5/16" x 5/16", Happy Birthday 1 7/8" x 5/16", I Miss You 1 1/4" x 5/16", Happy Holidays 1 7/8" x 5/16", Smile 5/8" x 5/16", Hugs & Kisses 1 7/8" x 5/16", Thinking of You 2" x 5/16", I'm Here for You 2 1/16" x 5/16", Merry Christmas 2 3/16" x 5/16", Congratulations 2 3/16" x 5/16", You Are the Best 2 3/16" x 5/16", Best Wishes 1 9/16" x 5/16", I'm Sorry 1 1/8" x 5/16", Sending Hugs 1 3/4" x 5/16", Lots of Love 1 5/8" x 5/16". Clear stamp sets include the name of the set on the sticker for easy identification. Our clear stamps and Die-namics are made in the USA. Clear stamps from Picket Fence Studios featuring the sentiments "Right this very moment in time I'm thinking of you", "I love you", and "Flying by to say hi". Unique, beautiful and creative stamps designed by Nicole Petersen. Use with paints and inks. Perfect for card making, journaling, scrapbooking, and mixed media. Clear stamps from Picket Fence Studios featuring a girl blowing bubbles and the sentiments "Have a bubbly day", "Happy Birthday", "When life brings you troubles blow lots of bubbles", and "For ever and ever and ever and ever". Unique, beautiful and creative stamps designed by Nicole Petersen. Use with paints and inks. Perfect for card making, journaling, scrapbooking, and mixed media. Dog themed clear stamps from Picket Fence Studios featuring an assortment of dogs and the sentiments "The best therapist has four legs and fur", "We woof you", "Get well soon", "It takes many differences to make the world go around", and more. Unique, beautiful and creative stamps designed by Nicole Petersen. Use with paints and inks. Perfect for card making, journaling, scrapbooking, and mixed media. When you want to send a greeting from "me, myself, and I", it can sometimes be difficult to find the perfect sentiment that reflects a single sender and recipientwith From Me to You, your problem is solved! This collection of ten phrases encompasses a variety of occasions geared for sending from a singular person. This 10 piece set includes: I Will Always Be Here for You 2 1/16" x 3/8", I Hope You Feel Better Soon 2 1/4" x 3/8", From Me to You on Your Birthday 2 5/16" x 3/8", Congratulations from Me to You 2 5/16" x 3/8", I Am so Very Sorry for Your Loss 2 1/2" x 3/8", You Are in My Heart 2 11/16" x 1/8", I Am so Proud of You 2 3/4" x 1/8", I Wish You a Happy Birthday 3 5/8" x 1/8", With My Sincere Thanks 3 1/8" x 1/8", I Love You 1 1/4" x 1/8". Clear stamp sets include the name of the set on the sticker for easy identification. Our clear stamps and Die-namics are made in the USA. This bevy of beautiful buds will pair beautifully with the Love Bugs collection. Create lush scenes for your sweet buggy friends and mix and match sentiments from both sets to create an endless variety of cards suitable for most any occasion. This set features a wide variety of floral options in a whimsical style including separate flower heads and stem options to build your own! This 18 piece set includes: Striped flower w/ stem 5/8" x 1 15/16", Five-petal flower w/ stem 9/16" x 1 3/8", Eight-petal flower w/ stem 3/4" x 1 11/16", Double flower w/ stem 1" x 1 3/4", Double flower 13/16", Five-petal flower 9/16", Six-petal flower 11/16", Eight-petal flowers (2) 7/8", 13/16", Sunflower 5/8", Gerbera daisy 5/8", Stems (2) 5/8" x 2 3/4", 1/2" x 1 7/8", Wishing You a Lovely Birthday 3" x 3/16", Have a Beautiful Day 2 1/8" x 3/16", Love You Bunches 1 7/8" x 3/16", Hello There, Friend 1 7/8" x 3/16", Why, Thank You! 1 9/16" x 3/16". Christmas themed Penny Black clear stamps featuring Snowflake Sentiments. This 8 piece clear stamp set features a prim lady, three friends on a bench and great sentiments for any occasion: "Laugh lots!" "Aging asks the question what did I come in here for?" "We'll be friends until we're old and senile then we'll be new friends!" "Oh, exercise? I thought you said accessorize!" "Laugh harder... it counts as exercise!" "Dare to be fabulous!" Clear stamps featuring the sentiments "Just Be You", "Spring Flower", "She believed she could so she did", "Believe in Yourself", and "With Love". Designs by Sheena Douglass. Acid & lignin free. These versatile and easy-to-use stamp sets are a great way to create beautiful and elegant cardmaking projects. To use these stamps simply peel them from the backing sheet and place onto a acrylic block (not provided) ink the stamp up and stamp. Once you are done simply peel the stamp off the acrylic block and wipe clean with an alcohol free baby wipe or wash in soapy water, leave to dry and return to the clear backing sheet. Clear photopolymer 4" x 6" stamp set featuring a bouquet of hearts and the sentiments "Get Well Soon", "Celebrate Your Day", "Thinking of You", and "Do What You Love". 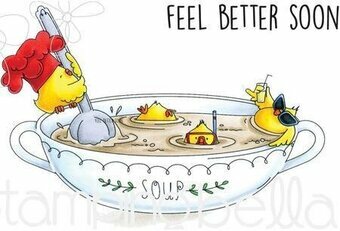 Cling stamp featuring chicken soup and the sentiment "Feel Better Soon". Loads of Wishes will be another set you reach for over & over again. Enjoy the new hearts, sentiments, and greetings for all your crafting needs. 15 total stamps. Thinking Of You sentiment measures: 3 1/8" x 3/4"; Congratulations And Best Wishes sentiment measures: 3 1/2" x 11/16"; large heart (lower left corner) measures: 3/8" x 3/8". Our Exclusive clear stamps are proudly made in the USA. Ideal for those with a sweet tooth and those who don't mind to share, this candy is just one way to say a heartfelt message! Containing 60 elements, this set has you covered with the entire alphabet and range of numbers (you can easily rotate the number 6 to a number 9) so you can make your own personal message in the candy. These fit perfectly inside the large sweet shape or in the sweetie tube. Or if you prefer, there are numerous short but heartfelt sentiments that are also perfectly sized to fit inside the large candy piece. There are tons of other smaller elements such as kisses, love heart borders and a smaller sweet. For the Love of Stamps is the new stamping range from premier papercraft manufacturer Hunkydory Crafts! 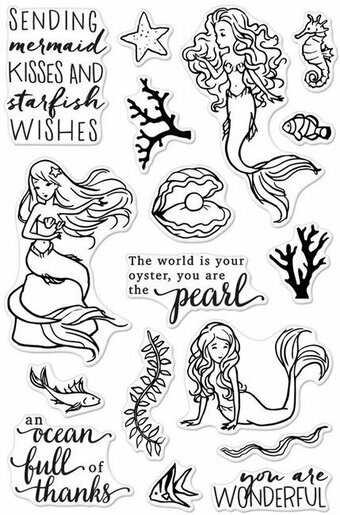 This exciting new collection of fantastic clear, photopolymer stamps have been designed to suit all manner of craft projects and allow you to get extra-creative with that trademark Hunkydory style. Size: A6. Wish your friends a sunny hello with this easy-to-color image. Image measures approximately 4" X 2-3/4". This original design by Fran Seiford is deeply etched and precision cut from premium gray rubber on a 1/8" gray rubber foam backing then mounted on a cling vinyl decal with full sized image for easier storage and use with an acrylic handle sold separately. Made in the USA. Cling stamp from Carabelle Studio featuring the Moon and the sentiment "Life is better when you believe in your dreams". Penny Black clear stamp featuring a tea pot, a tea cup, and sentiments related to tea and friendship. Make a splash with your spring themed well wishes and send along your greetings in a pair of designer rain boots! Ideal for both the garden fanatic, and the little one who still loves to jump in the puddles, these darling boot images create a wonderful focal point on handmade cards, or delightful die cut embellishments on scrapbook layouts and altered art pieces. Two heartfelt sentiments and an illustration of softly falling rain round out this cling stamp set and are ideal for any spring themed project! Approximate Image Sizes: 1. Floral Rain Boot: 3.0 x 2.0", 2. Striped Rain Boot: 3.0" x 2.0", 3. Falling Rain Accent: 1.75" x 1.75", 4. Hope all is Well Sentiment: 1.5" x 1.25", 5. Thinking of You Sentiment: 1.5" x 1.0". These cling stamps are ready to use with our Acrylic Blocks. Included with stamp set: 1. Storage panel for use with a two or three ring binder, 2. Stamp packaging can also be used as a storage box for the stamp(s). Clear stamps featuring "LOL", "OMG", "THX", "Hey Girl", "Thinking of You", "Get Well Soon", and more. Hero Arts 4″x6″ clear stamp sets offer the best quality in the market. They are made in the USA from genuine photopolymer, which is non-toxic, biodegradable, and designed specifically to transfer ink to paper for a true impression every time. Peel off your stamp from its backing and stick to an acrylic block for easy positioning. Mix and match the designs, then clean with water or stamp cleaner. These sprightly toads are sure to put a little extra pep in your step. With infectious smiles, bounding energy, and personality to spare, they'll bring exuberance to a variety of card themes. Even if you don't normally grab coordinating Die-namics, make an exception this time around to ensure you have the lilypad die and slider channel die so you can add exciting movement to your funny frogs. This 12 piece set includes: Toads (3) 2" x 2 1/2", 1 3/4" x 2", 1 5/8" x 2", Heart trio 1/2" x 5/8", Kiss Me 11/16" x 1/8", Hoppy Hoppy Joy Joy 1 5/16" x 3/8", Have I Toad You Lately That I Love You? 2 1/4" x 3/8", You Make Me Jump for Joy 2 3/4" x 1/8", To a TOAD-ALLY Awesome Friends 3 1/4" x 1/8", I'm So Happy for You 2" x 1/8", How Are Things in Your Part of the Pond? 2 3/16" x 3/8", Sorry You're Feeling Green 2 1/2" x 1/8". Clear stamp sets include the name of the set on the sticker for easy identification. Our clear stamps and Die-namics are made in the USA. 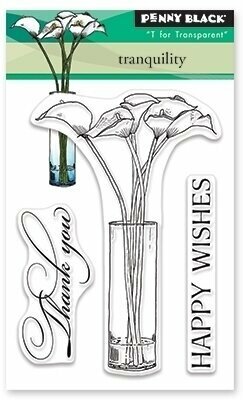 Penny Black clear stamps featuring flowers and the sentiments "Thank You" and "Happy Wishes". Never fear - this burly Viking from Birdie Brown is equipped with friendly greetings in addition to an axe and shield (strictly for looks - he won't hurt you!) Don't be intimidated by his impressive facial hair and weather-friendly attire, he's really just a big teddy bear. Tell someone you love that you're so impressed by their bravery with this unforgettable look. This 4 piece set includes: Viking 2 1/2" x 2 9/16", Sentiments (3) ranging from 1 1/8" (I Vike You Very Much) to 1 11/16" (You're So Brave) in length. Clear stamp sets include the name of the set on the sticker for easy identification. Our clear stamps and Die-namics are made in the USA. Cling stamps featuring flowers, "Hello Sunshine", and "May flowers always line your path and sunshine light your way". This quality cling-mount rubber stamp set is made from deeply etched, precision trimmed premium grey rubber. With 1/8 inch thick grey foam for a smooth impression on uneven or textured surfaces, it is backed with a full sized index of the image. The index allows for precise placement of the image when used with a clear acrylic handle. Memory Box clear stamps featuring llamas, "Lean on me", "Love being your friend", "Live Laugh Love", and "Sending my love". 4 x 6 inches stamp set. 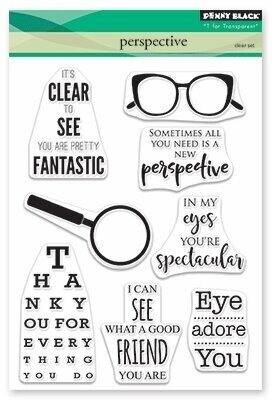 Penny Black clear stamps featuring and eye chart and the sentiments "It's clear to see you are pretty fantastic", "Thank you for everything you do", "I can see what a good friend you are", and more. 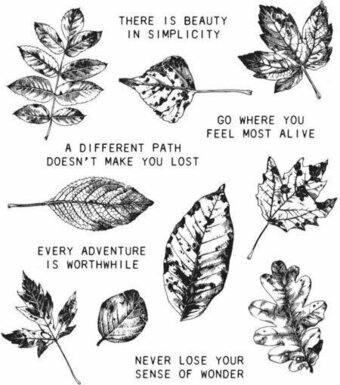 If you love love (and who doesn't?!?) then you NEED the From the Heart stamp set. 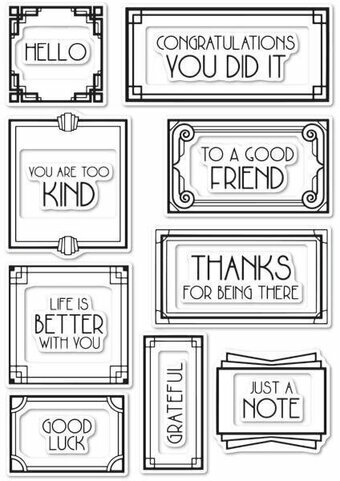 This comprehensive set of phrases features the perfect sentiment for any recipient. The clean and classic font means the greetings will coordinate with any style, any occasion, and any coordinating image. Link the sentiments together to create longer phrases or mix and match to come up with perfect follow-up greetings for the card interior. These are sized to perfectly complement the Hearts in a Row Die-namics. Trust us when we say you need this set. (Did we already say that? We really mean it!) This 44 piece set includes sentiments (43) ranging from 5/8" to 3 3/8" in length, Heart accent 1/8" x 1/8". Clear stamp sets include the name of the set on the sticker for easy identification. Our clear stamps and Die-namics are made in the USA. Hero Arts clear stamps offer the best quality in the market. They are made in the USA from genuine photopolymer, which is non-toxic, biodegradable, and designed specifically to transfer ink to paper for a true impression every time. Peel off your stamp from its backing and stick to an acrylic block for easy positioning. Mix and match the designs, then clean with water or stamp cleaner. Impression Obsession cling stamp featuring the sentiment "Home Sweet Home". 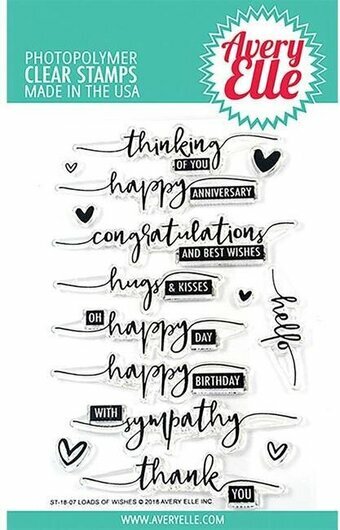 Penny Black clear stamps featuring the sentiments "This is one of my favorite days... celebrating you", "Have fun and smile today", "Good Times, Good Friends, Good Laughs", "Happy Birthday", and more. 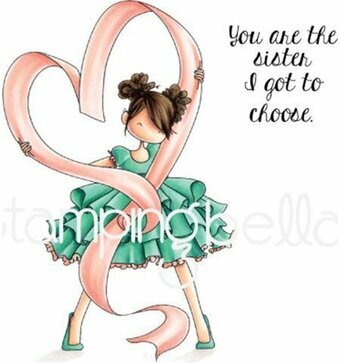 Friendship themed cling rubber stamp from Stamping Bella featuring the sentiment "You are the Sister I got to choose". Clear stamp from Brutus Monroe featuring a little boy astronaut, "Never stop dreaming", "You can do it", "Reach for the stars", and "You are amazing". One of Fran's favorite styles is back with new greetings and fun. Great to color, our Window Messages are perfect for any occasion. This Large 4" X 6" set of Perfectly Clear Stamps features premium photopolymer images from exclusive Fran Seiford artwork. Interactive images work together for dozens of fun looks. Use with acrylic handle sold separately. Made in the USA. 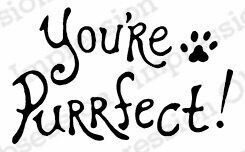 Impression Obsession cling stamp featuring the sentiment "You're Purrfect" along with a cat's paw print. Five frogs in "yoga" poses try to convince you that "life is better when you bend". 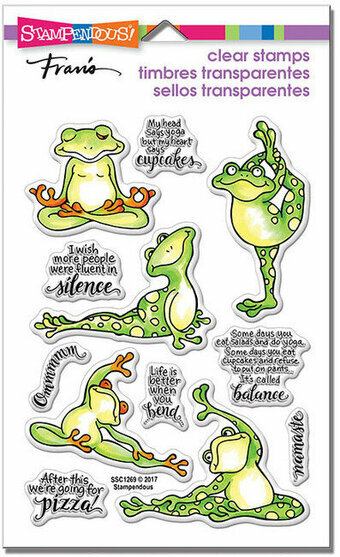 12 stamp set includes seven sentiments glorifying and poking gentle fun at yoga. This Large 4" X 6" set of Perfectly Clear Stamps features premium photopolymer images from exclusive Fran Seiford artwork. Interactive images work together for dozens of fun looks. Use with acrylic handle sold separately. Made in the USA. "God gave us memories that we might have roses in December". Create some nice memories for family and friends by stamping some handmade projects to celebrate Spring. This original design by Fran Seiford is deeply etched and precision cut from premium gray rubber on a 1/8" gray rubber foam backing then mounted on a cling vinyl decal with full sized image for easier storage and use with an acrylic handle sold separately. Made in the USA. Beautiful EZMount rubber stamp set. Create enchanting craft projects with this fantastic stamp. This stamp contains 1 individual image & 8 individual sentiments. Each stamp is deeply etched onto pink rubber, mounted to EZMount Static Cling Cushion and hand cut close to each image so it is ready to use with an acrylic block right out of the package! The stamp is then packaged onto our indexed, binder-ready storage panels which fit perfectly into our EZMount Clear Enclosed Mini Binder Item #SS20! Suitable for use with many different coloring mediums, you can create amazing effects and color with Spectrum Noir Sparkle Markers, Spectrum Noir Makers, Spectrum Noir Blendable Pencils or Spectrum Aqua Markers. Largest Stamp Size 2.4" x 1.9" (9 pc). Clear Stamp from Impression Obsession featuring the sentiment "life is better with friends." Impression Obsession cling stamp featuring the inspirational sentiment "when life gives you more than you can stand... kneel". Join us in our effort to put a smile on someone's face when they open their mailbox and find a hand-made card! Practice a Random Act of Cardness every day and send someone a greeting when they least expect it! 4 clear stamps on a 2" x 2 1/2" storage sheet. Made in the USA using the highest-quality photopolymer. Show them you're thinking of them. Image measures approximately 1-3/4" X 1-1/4". This original design by Fran Seiford is deeply etched and precision cut from premium gray rubber on a 1/8" gray rubber foam backing then mounted on a cling vinyl decal with full sized image for easier storage and use with an acrylic handle sold separately. 4" x 6" clear stamp featuring various quirky messages to update your holiday cardmaking game. "Let's get stuffed! ", "season's eatings", "Santa knows you've beed bad! ", "my mom" "my spouse" "my family" "made me send this card", and much more! 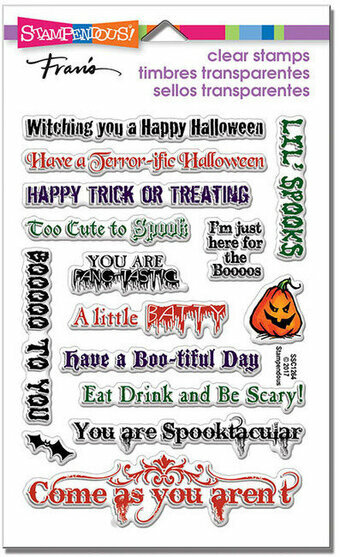 Tons of wonderfully spooky greetings fill this set for happy Halloween stamping. 15 stamps. This Large 4" X 6" set of Perfectly Clear Stamps features premium photopolymer images from exclusive Fran Seiford artwork. Interactive images work together for dozens of fun looks. Use with acrylic handle sold separately. 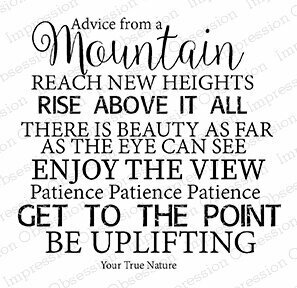 Clear Stamp from Impression Obsession featuring the motivational sentiments "Advice from a mountain: reach new heights, rise above it all, there is beauty as far as the eye can see, enjoy the view, patience patience patience, get to the point, be uplifting." 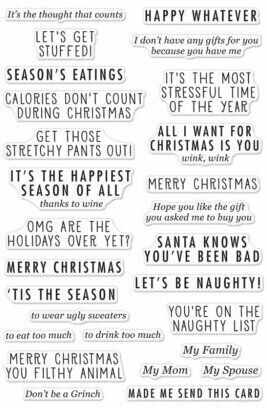 A scrolly sentiment for holiday or any time. Image measures approximately 2-1/4" X 2-1/4". This original design by Fran Seiford is deeply etched and precision cut from premium gray rubber on a 1/8" gray rubber foam backing then mounted on a cling vinyl decal with full sized image for easier storage and use with an acrylic handle sold separately. Impression Obsession cling stamp featuring the sentiment "sometimes being with your best friend is all the therapy you need." Hero Arts clear stamp featuring a collection of whimsical celestial images and messages. Coordinates with HA-DI427. Clear Stamp from Impression Obsession featuring the sentiment "as we grow older, we don't lose friends, we just find out who the real ones are." Clear stamps from Memory Box featuring the Christmas sentiments "merry Christmas", "we wish you a", "from all of us", and "wishing you a very." 2 x 3 inches clear stamp set. 5 clear stamps included. If you don't see what you're looking for, make a Special Request and let us find it for you! Copyright © 1997-2019, 1-2-3 Stitch!®, Bluffdale Utah. All Rights Reserved.